According to the Merriam Webster’s dictionary a bootlicker is a person who tries to gain favor with another through a servile or sycophantic manner. I am prompted to write about a recent bootlicking controversy since a number of concerned Christians have asked me to comment. 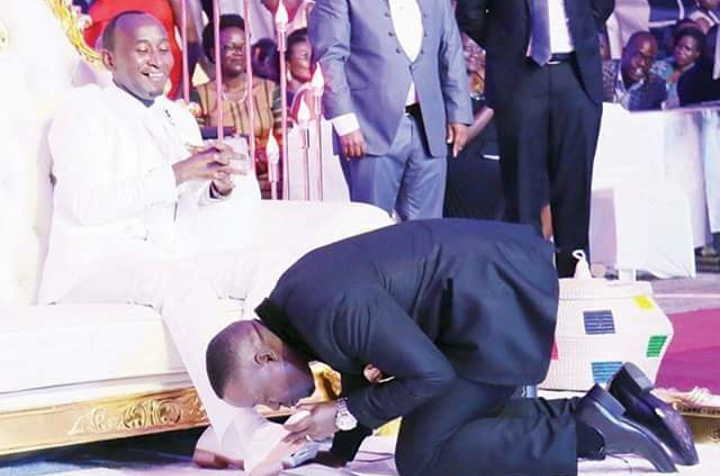 The incident in question was performed at the Kololo Independence Grounds in Kampala when a certain born again Christian gentleman who is also a journalist went ahead to literally not figuratively bootlick the shoes of a Prophet who had organized a Christian function there. 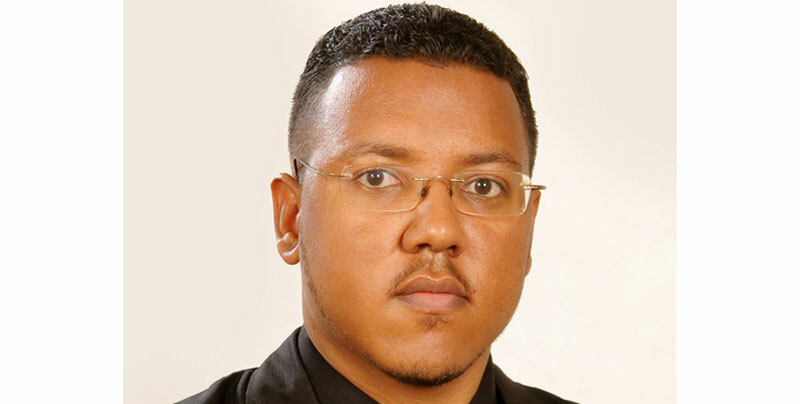 Though a lot of condemnation has come out concerning this incident with many labeling the Man of God a false prophet, I will endeavor to provide a balanced commentary on the whole controversy from a fellow minister’s perspective. I believe for anyone to examine such an issue they must have full knowledge of the Bible and have a personal relationship with Jesus Christ in order to interpret God’s word and apply it in real life. Many of the commentators are not even born again Christians who may be inspired to cast the man and the ministry in bad light simply out of ignorance and their loathing of the cause of Christ. That is why I tend to take various reports concerning this Prophet with a pinch of salt. Do Christians honor their Leaders enough? Even before I look into the appropriateness or not of kissing a human Prophet’s shoes, I wish to examine the aspect of honor. Many Christians in today’s Churches dishonor and disrespect their spiritual leaders. According to 1 Timothy 5:17, Apostle Paul declares that the church elders who include Apostles, Prophets and other members of the five-fold ministry (Eph 4:11) ought to receive double honor. This honor includes verbal or physical acts of showing gratitude and financial reward. In the secular world those who give inspirational speeches are given an honorarium. An honorarium is defined as a payment for a service (as making a speech) on which custom or propriety forbids a price to be set. You will find that the same person who would gladly pay millions to the Governor Bank of Uganda to come and give a speech at their company event or association function will balk at the same honors being bestowed upon a servant of the Most High God. Yet the servant of God is not merely speaking but performing spiritual ministry by assignment from Jesus Christ and not an earthly government. In today’s world the balances are tipped more towards dishonor than honor of spiritual ministers in general. You will find Christians having their Pastors and Prophets for dinner as they “backbite” them and criticize them for every trivial issue. When was the last time you heard of a church organizing an impromptu and congregation driven surprise party in honor of their church leadership? I heard a Pastor one time complaining of how after giving a moving sermon no congregation member came to verbally appreciate him for the great work done, instead they just walked out. Many believers are taking the leaders who feed them spiritually for granted and come with an entitlement mentality to church. I believe that part of the reason for the “bootlicking” uproar is because of the erosion of the culture of honoring genuine spiritual leaders. Do we have Prophets today? I commonly hear a term called “self appointed” or “self proclaimed” Prophet being touted by critics. For a Bible student as myself I really find this laughable. You will find someone who hears another person being referred to as a Prophet automatically labeling them a false prophet in ignorance. After Jesus ascended to heaven he left the church with five ministry leadership gifts that include the Apostles, Prophets, Evangelists, Pastors and Teachers (Eph 4:11). These ministry gifts are appointed by Jesus Christ (not man, mainstream religion or media practitioners) and are supposed to be in action till the Church becomes fully like Jesus Christ (Eph 4:14) which is still a long ways away. The time frame for the activity of these gifts is till the return of Jesus Christ. Above all we have to realize that the Apostles and Prophets are the foundational gifts in the body of Christ and provide leadership and covering to the other 3 gifts (Eph 2:20) and the church at large. The office of the Prophet in the New Testament is far different from the Prophetic office of the Old Testament, but that will require a whole new article to cover and teach about. In the New Testament we have examples of Prophets such as Agabus, Judas and Silas. For a New Testament taught Christian it is not a surprise to have Prophets functioning in the Church as they are the ministry gift mandated with revealing the plans and purposes of God for the church. Should a Christian bow down to a Prophet or other church leaders? We have a clear example in the New Testament of a soldier called Cornelius in the city of Caesarea who bowed down to the ground in worship of Apostle Simon Peter. Did Apostle Peter condone the behavior of this servile admirer? The answer is a big NO. Cornelius had witnessed an angelic heavenly vision telling him to send for Apostle Peter and this could have been a motivating factor for him to figuratively become a “bootlicker”. However, Apostle Peter would not tolerate this. Apostle Paul faced a similar dilemma after the healing of the lame man at Lystra (Acts 14:11-18). The Apostle tried to restrain the worshippers of the Greek gods from worshipping them but his speech for them to stop was in vain. It is one thing for those who have witnessed manifestations of the Holy Spirit through a Prophet to impute these signs to him as a person and idolize him inappropriately. It is another thing for this Prophet to assent to this worship since this now enters the realm of idolatry. Every Church member should realize that their leaders though called and anointed by God are just men and not God Almighty. Every minister including my fellow Apostles and colleagues in the five-fold ministry ought to realize that much as we represent Jesus Christ, we are not and cannot replace Jesus Christ the Son of God. A wise old man told me that many ministers who start out on the straight and narrow spiritual path end up derailing when various honors and special “Pastor’s Chairs” are prepared for them. When this glory and pride get to the minister’s head, it is a recipe for spiritual disaster. This is a path of pride for which Lucifer was cast out of heaven. I have no problem with ministers being honored financially as individuals and I believe this honor is not as forthcoming in today’s church as it should be. I also believe that Christians ought to support the gospel and churches financially. This is referred to as financial partnership and was practiced by the Phillipian Church (Phil 4:14-19) and other members of the early church who sold lands and houses and gave the proceeds of the sales to the Apostles. So if someone criticizes a pledge card of 1,000,000 Uganda Shillings it shows ignorance of the even greater figures sowed or given by the early church (Acts 4:34-35) that would be in the range of 100,000,000 Uganda Shillings, the average cost of a 3 bedroom house today. In summary I would say that believers need to have a Biblically accurate view of giving or financial partnership towards the gospel, honoring the spiritual leadership and understanding of the Prophetic office. I believe that excesses such as the assented to “bootlicking” that was performed on the Prophet’s shoes are errors that the Prophet can repent of before God and warn his fellowship members to refrain from doing. The Bible clearly warns us to flee from idolatry (1Cor 10:14). Otherwise, tolerating worship of a human, called of God or not, plunges the Church into the sin and abyss of idolatry which God hates. Why do Ugandans think ‘life is short’?